More racist graffiti was found Friday at California High School in San Ramon. The graffiti was discovered in the boys bathroom and is the fourth incident of racist graffiti to hit the East Bay campus this school year, San Ramon Valley Unified School District spokesperson Liz Graswich said. 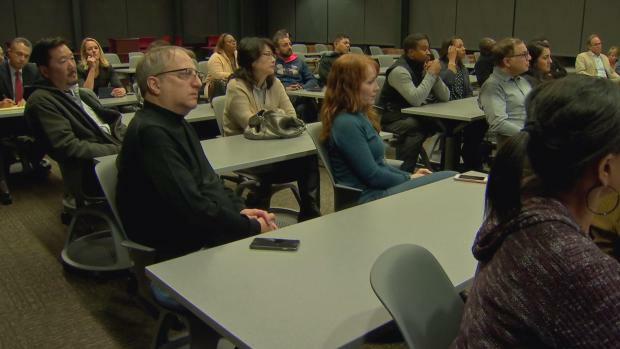 School officials on Friday night held a meeting to discuss the latest incident with parents, who were outraged and demanded change. More than 100 people came together to discuss concerns and solutions. But many parents are now demanding the immediate expulsion of anyone caught scribbling racist messages on walls or shouting them at other students. "When are you going to actually do something?" one attendee asked. The San Ramon Valley Unified School District on Thursday confirmed yet another incident of racist graffiti at one of its high schools. It is the fourth incident in the district this school year. Cheryl Hurd reports. For his part, parent Landon Edmond advocated "very clear communication about a district policy that says, 'There's zero tolerance for activities like this.' If that's not the dialogue from the district, they're missing it." Friday's incident comes a day after similar graffiti was also found at the school. On Wednesday, racial scribblings were found in a boys bathroom at nearby Monte Vista High School in Danville. Graswich said the other two incidents of racist graffiti at Cal High were found on Oct. 19 and Oct. 24. Increased supervision and regular bathroom checks will now be in place at the campus, Graswich said. School district leaders plan to meet after Thanksgiving break to discuss discrimination polices and what can be done to prevent similar incidents in the future.